Anticipating the day when even Mazinger Z would not be able to withstand the vast forces of the ancient Mycenaese Empire that Dr. Hell had unleashed, Mazinger Z pilot Koji Kabuto's father had been secretly developing an even more powerful robot: Great Mazinger. Piloted by the reliable Testuya Tsurugi, Great Mazinger takes up the fight against a reincarnated Dr. Hell where Mazinger Z had fallen! Mazinga was one of the first four Shogun Warriors released in the US and was my favorite Shogun Warriors. 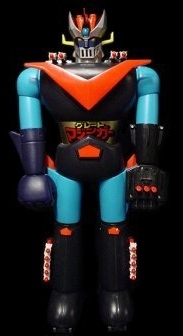 Mazinga was based on Mazinger Z and Great Mazinger from Japanese Manga (comics) and Anime (cartoons). Both Mazinger Z and Great Mazinger robots were controlled by a pilot who would fly his plane (Brain Condor) into a docking port that made up their craniums. The Mattel toy reflected this with a removable plane (Spaceship Brain) in the first two versions (called "Mazinga" on the box), and an unremovable one in the later versions (renamed "Great Mazinga" on the box). Mazinga came with two swords (even though he could only hold one), and a hand with rocket firing fingers. The figure initially came with 14 rockets with rocket holders on his shoulders and legs. Later versions came with only 10. As with the other initial release Shogun Warriors, Mazinga under went several running changes during its production: (As a note, each version's boxes usually reflected the interior toy's configuration, came with small cardboard inserts, instructions (rarely seen) and a Mattel warranty card). The first release may be identified by several features: The head mold is much more defined and pointed with an unusual arrow shaped hole on top for the removable plane. The firing hand is molded in a navy blue and has only 3 screws holding it together (if opened, the firing mechanism for each rocket is made of a single piece of plastic with a metal spring). The chest "V" is a separate piece of red molded plastic, very pointed, and juts from the chest. The wheel trucks on the bottom of this version's feet are molded on the feet, as are the missile holders on the shoulder. The missiles have true triangular vanes (unlike the later versions which have clipped vanes...as a note, the triangular vaned rockets are later used by Gaiking. The red shield decal on the knees is usually split as it straddles the upper and lower leg. This version comes with 14 rockets (the leg holders hold seven each) and two swords. The second release was basically a refinement of the first release. The head mould has more rounded corners and the hole for the removable plane is triangular. The firing hand is moulded in black and has 4 screws (the firing mechanism is now made of two pieces with a metal spring). The chest "V" is larger and has heavier points and sharper corners. The wheel trucks are now separate, held on with two screws, as are the shoulder missile holders. The missiles have clipped vanes and the knee shield is now moulded on the bottom half of the leg. This version comes with 14 clipped-vaned rockets. CONTENTS: MAZINGA™ warrior 23 1/2" tall, with rocket-firing fist, 14 rockets, two swords & accessories. Arms are detachable. Comes FULLY ASSEMBLED. Swords and rockets not for use with all SHOGUN© Warriors.